A great Russian composer Michael Ivanovich Glinka was a founder of Russian vocal school, a well-known teacher of singing, a chapel-master of a chapel folk. Doing practical work with singers, Glinka was deeply interested in methodology of vocal training and strived to systemize his rich pedagogical experience. Two vocal-pedagogical works by M.I. 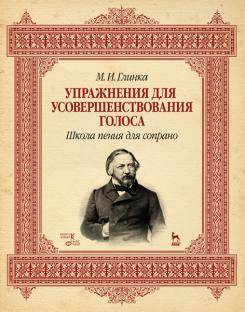 Glinka: «Exercises for voice development, methodical explanations to them and vocalization-solfeggio» and «Vocal school for soprano» are presented in this book for the first time. Glinka formulated the method of voice training — «first to refine on natural tones», that is to learn and strengthen the notes of midrange and then to add the notes of close registers to them. The method was later called «concentric». It is effective just as for primary voice strengthening and registers’ adjustment so for the support of the optimal singing form as everyday exercises. The given book is intended for teachers, students, who learn professional singing and also for a wide range of singing fans.